What do people talk about during a spacewalk? Is it all work and serious, or are there lighter moments? RBTH tries to find some answers. On August 10, two Russian cosmonauts on the International Space Station (ISS) ventured outside. 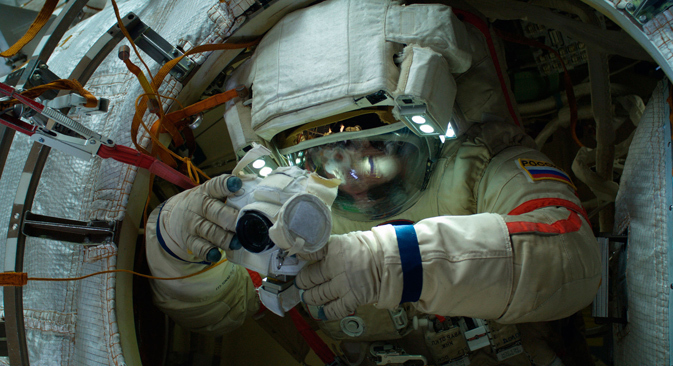 The commander, Gennady Padalka, and flight engineer, Mikhail Kornienko, completed several tasks - cleaning windows, collecting debris samples from the station’s solar panels, installing mounts for new antennas, and taking photos of the Russian orbital segment. RBTH followed the mission’s live online broadcast to hear what Russian spacemen talk about. Cleaning a space station’s windows is not an easy task, and the cosmonauts said they could not find a comfortable position to do it. K: You know, I’m also going at it tooth and nail. P: Then you’ve got an attitude problem. K: Me? I’ve got an attitude problem? OK, fine. Oleg Kononenko is another member of the ISS crew from Russia, but he stayed inside the station during the mission. Still, his friends never stopped joking with him. Padalka: Well Oleg, you took some photos of me, or what? He’s so gorging himself on borsht right now. One of the mission objectives was to take several photos of the Russian orbital segment of the ISS. But while at it, they took a couple of photos of themselves. K: It’s not a big deal, we’re going to take some more!